Stamp With Tam: Where did the week go? Have you ever had one of those weeks were you feel like you have been really busy all week and at the end it feels like you achieved nothing? Well that was my week! 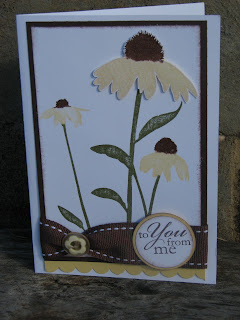 I really wanted to have a go at the Just Add Ink challenge last week but didn't get there in time but decided yesterday I would still have a go... the challenge was to use the colours Chocolate Chip, Barley Banana and Kiwi Kiss, But since I knew I was entering the card I changed the Kiwi Kiss to Old Olive I thought it suited the stems better. Maybe this week I will get a bit more organized and have a few more things for you to look at. another fantastic card. as with the medallian stamp, this one is not one of my favs as you know, but you always manage to make them look great. good luck with the challenge. p.s. - my weeks are always like that! This is a lovely card, Tammy. I love what you have done with the ribbon, just perfect.